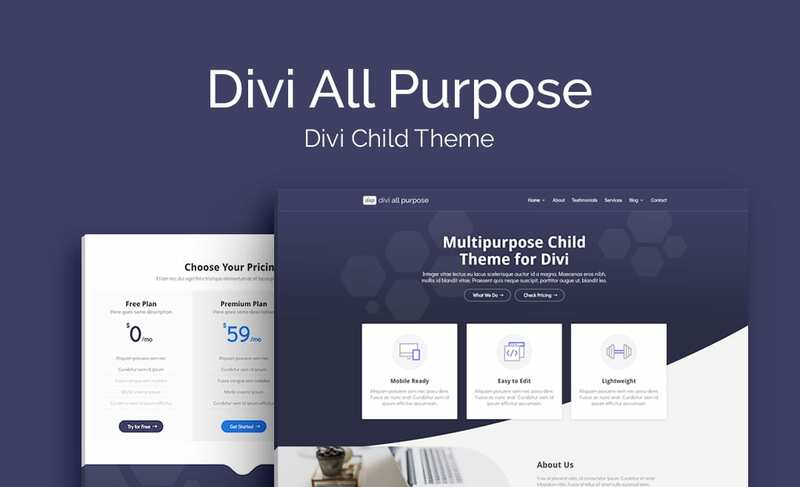 Beautiful, versatile and built to satisfy a number of business categories, Divi All Purpose allows you to craft countless Divi websites from one single child theme. Developed to help Divi designers build high-quality websites at rapid speed, Divi All Purpose is multipurpose Divi child theme that can be used over and over again in numerous applications. Four alternate home pages showcase the versatile nature of the child theme, whereby simple changes to fonts, colors and content will result in a completely new, wholly unique looking website. Complete with six exquisitely designed pages, each filled to the brim with beautifully crafted and custom styled elements, Divi All Purpose presents an all-inclusive, out of the box solution that requires little effort to customize. Users simply need to enter their original content and imagery, and in no time, Divi All Purpose has helped create a brand new web presence. Divi All Purpose ships with a number of fabulous features, including a custom header and footer, a unique blog feed complete with attractive left sidebar, right sidebar and full-width templates, as well as an extensive Services page and an already set up testimonials section to display positive customer feedback. Please note, unlike our other Divi child themes, Divi All Purpose does not include the premium features (such as the Login Customizer to customize the default wp-admin login page as well as the 404 Error Page template to create an error redirect page) as available in our other products. Thanks so much for providing this awesome layout, it’s a great design and will make setting a new website all the easier! This is a great Divi layout. I have been a member of your for almost a year, is there any new premium themes that have come out. Hi Shane, thank you for the kind words. Since we launched the membership less than a year ago we have released 3 new premium child themes, the newest being Divi Nonprofit, and as many new premium plugins. We are currently working on completing a new premium child theme that should be launched soon as well. The best 300$ ever spent! You guys deserve more and more clients! Aspen membership is the best Elegant Themes membership friend!